I wanted to mention a few more things about our fishing trip to the Mississippi Delta. Saturday was a big disappointment. It was a beautiful day- and amazing sunrise- and perfect temps. We could tell the wind was going to be up, but still confident in landing redfish early and often. On about my third cast in open ocean (about 3 ft deep) I hit a big one. The technique is fun. I threw a nice spin cast rod and reel with 50 lb braided line. I had a plastic jig tied on just below a large cork. Once you hit the water you begin a retrieve and POP technique. I popped, reeled, popped, reeled, popped BOOM! When a redfish hits, you know it ain't no catfish. But I thought I missed him, my line went limp and I paused..... bad mistake- the cork was still under and the big red was running right at me. Mike Frenette yelled at me, "REEL!" I began to try and catch up and then he went in reverse- the power is hard to describe on that light tackle- but oh my! did he pull and then... SNAP... line broke. Mike's stinging commentary, "You let him wrap the line around the cork. That was a big fish you just missed." (Thanks for telling me). 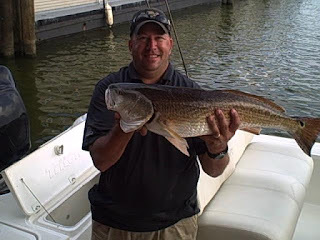 Unfortunately, that was the last big redfish hit I had that day ( I did get a small one 2 or 3 lbs). We did nothing.... yeah, we caught about 50 catfish, Bill even caught a nice largemouth bass. But the redfish were not eating... we saw them but did not catch them. 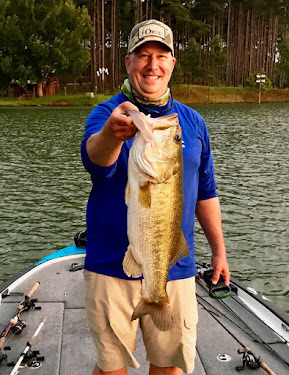 Bill caught about a 7 lb. redfish late in the day. Mike last comment- "This was the worst outing I have had in three years.". But we knew we had another day. We just had to keep after it- and Sunday will be a memory for the ages.